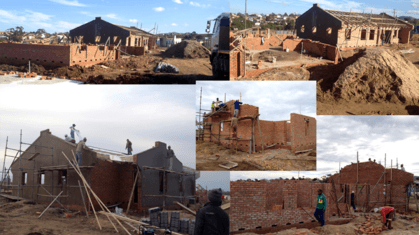 Humansdorp: construction project almost complete! In the recent newsletters of Hour of Power we have called up a few times with the aid fund Heart for Children to stop children in the slums of South Africa from being on the waiting list. Heart for Children aims for a situation in which a maximum of six children can grow up in a family setting with a mother (and a father). In Humansdorp in South Africa a piece of agricultural land was found for this purpose, where three houses could be built. The construction of the houses costs € 55,000 each. That money came together thanks to the many gifts Hart voor Kinderen received from many of you. As you can see on the pictures, we are working hard and the construction of these 3 houses is progressing at a good pace. The ground has been leveled, the foundations laid, the floors poured and the walls built up to a large extent. These houses are intended for the care of children with disabilities. Three foster families with a total of a maximum of 18 of these children will soon be able to accommodate themselves! It is precisely children with disabilities who are rejected from their families and communities and are left to their own devices.